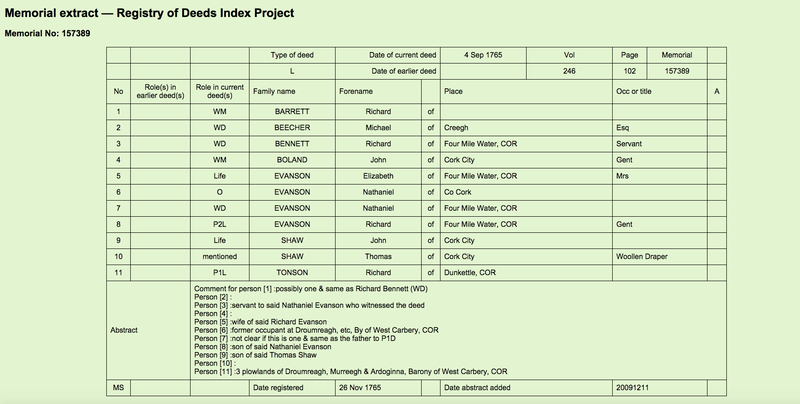 Acquisitions of Three Ploughlands at Dromreagh, Murreagh and Ardogina, Durrus, West Cork in 1765 by the Evanson Family from Tonsons (Hulls) and 1790s and Deed Disposing of Half Tithes of Durrus Kilcrohane 1790s the Tithes of Co. Cork Having Been Acquired by Richard Boyle The Great Earl of Cork, Early 17th Century by Underhand Means. The former Evanson house at Ardogeena is still occupied and probably dates from mid 18th century. The Evansons may have acquired the ploughlands earlier it looks like a marriage took place between Evanson. and Tonson (the Hull illegitimate line). Boyle acquired the tithes c 1610 there was widespread outcry but nothing was done. In the Tithe Allotments for 1830 Nathaniel Evanson owns the non clerical part. The townlands were originally O’Mahony territory, they probably mortgaged them to Richard Boyle, defaulted, he went into possession and they later were acquired by the Hulls who wee associated with Boyle. There was litigation mid 19th century between the Tonsons (Lord Riversdale) and the Evansons over the mineral rights to the townlands. It is probably that the Evansons introduced weavers from Armagh as did another branch of the Evanson across Dunmanus Bay. In the Tithe Allotments there are numerous very small farms associated with weaving families.